The 2011 Medal of Honor Commemorative $5 Gold Coin will be released by the United States Mint on February 25, 2011. The coins will appear along with commemorative silver dollars which are also issued to mark the 150th anniversary since the creation of the Medal. 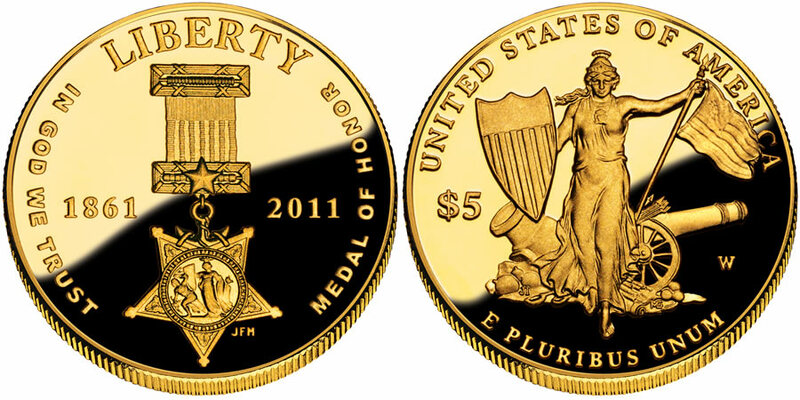 These coins will be struck in both proof and uncirculated condition and were authorized by the Medal of Honor Commemorative Coin Act of 2009, Public Law 111-91. Each will be struck from 90% gold and 10% alloy. Surcharges will be added to the sale of each strike in the amount of $35 which will be collected by the Mint and forwarded to the Congressional Medal of Honor Foundation. The Foundation will use this additional funding to continue its educational, scholarship and outreach programs. On the obverse of the $5 gold coin we find an image of the original Navy Medal of Honor authorized by Congress in 1861. The design was completed by United States Mint Sculptor-Engraver Joseph Menna and includes the inscriptions of "LIBERTY," "1861," "2011," "IN GOD WE TRUST" and "MEDAL OF HONOR." The reverse was designed by Artistic Infusion Program (AIP) Master Designer Joel Iskowitz and sculpted by Sculptor-Engraver Michael Gaudioso to show the mythical figure of Minerva flanked by a Civil War cannon and wheel. Also included are the inscriptions of "UNITED STATES OF AMERICA," "$5" and "E PLURIBUS UNUM."